I still can't help being infatuated with the Macbook Pro. I just love the very beautiful design, the incredible multimedia software bundle with it, the amazing battery life, and the "cool factor" that owning one provides. Ok the last reason was one of my top reasons for wanting a Mac. My other reasons were it's 8 hours of battery life, light weight, and it's superior operating system. But now, I am having second thoughts because I already have a Dell Studio XPS that I bought for the same price so it's like I'm throwing away money if ever I buy a Macbook Pro 13. Someone did offer to buy the computer but she's only going to buy it if I throw in a lot of extras like the Microsoft Office, Antivirus, Laptop Accessories (wireless mouse, cooler, bag), and a 16GB iPod Touch. I realized that I already spent a lot of money on those and giving them away for a lower price is crazy! I'm selling everything for just $1000. And the MBP 13 costs more than that and I have to get accessories and additional softwares like iWork if ever I buy a MBP 13 so I'll be spending more money. Although I have the money to get a MBP 13 now, I'll end up broke so it's not worth it. I still have a lot of more important things to spend my hard earned money on. It made me look back on the never ending Mac vs PC debate and I guess that with the release of Windows 7 this coming October 22, this gives Apple a run for their money. Windows 7 has somehow become a copycat yet improved the "dock" feature that Apple has. I actually am more accustomed to the Windows OS and I am actually quite happy with it despite the slow shutdown, start-up, and the occasional unresponsiveness. But Windows 7 addresses these issues plus the new OS isn't a system resource hog like the old Windows Vista. Windows 7 runs so efficitently that it can be used on a netbook. I am quite excited with the release of Windows 7 and getting a copy of the Windows 7 Ultimate for just $10.50 is the major deciding factor I had for stying with my beloved Dell Studio XPS 13. 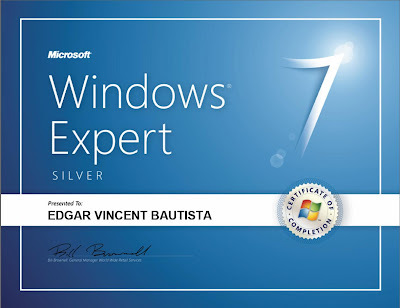 I got the copy of Windows 7 from expertzone.microsoft.com as a reward for completing the Windows 7 training course. I just have to break it gently to my friend that I have decided not to go on with our deal. This will be a final decision because I already had spoken to her before that I was sort of backing out from our deal. But since she didn't give me any money yet our deal isn't really finalized. I have been using my desktop for a while because I was selling my Dell but now that I've decided to stay with it, it's time to use it once more! LOL!